The MCLLEG adapter allows the operator to raise and maneuver up to a 400lb. 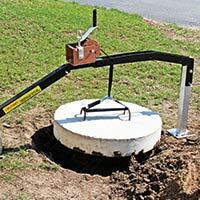 septic lid cover easily and ergonomically, reducing the chance for operator injury. The MCLLEG is comprised of an easy to turn manual worm gear winch and a 20’ long lifting strap with hook on a stabilizing leg that attaches to a dolly. The dolly system has a retractable handle with three angle positions of 90°, 105° and 120° , allowing the operator to choose their optimal lifting angle. Constructed with lightweight, corrosion resistant materials and heavy duty wheels for stability, the MCLLEG is also collapsible for compact storage and portability. or call Pete Friedrich toll-free at 1.888.582.0822.